Was born in 1939. Since 1944 lives on coast of the river of Ob, in Novosibirsk. 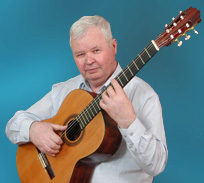 In 1964 entered the Gnesin's musical college in Moscow on a class of a classical guitar and graduated in 1969. His teachers were A.V.Kabanikhin and B.P.Khlopovsky.